A broad, global “risk on” scenario” has resurfaced over the past week through mid-March, rejecting the very early March selloff which was a reaction to heightened fears regarding a global economic slowdown. Although no significant positive developments have been made on the US-Sino trade negotiations in the period, the removal of a “No Deal” Brexit has afforded a more positive outlook for European and UK stock markets. Here we focus on the pan-European and UK benchmark indices, the EURO STOCXX 50 and FTSE 100 respectively, which have again hit new 2019 highs over the past 24 hours. A resilient consolidation Monday and a prod higher this morning to another new cycle high, to build on Friday’s surge (through resistances at 3273, 3289 and 3299/3300), having rebounded earlier in March from the bull trend line from mid-February (off of 3202), to keep risks higher for Tuesday. We see an intermediate-term bull theme. We see an upside bias for 3312 and 3315; break here aims for 3335, 3333 and maybe 3344. But below 3288 opens risk down to 3271, which we would look to try to hold. Below aims for 3261/58. 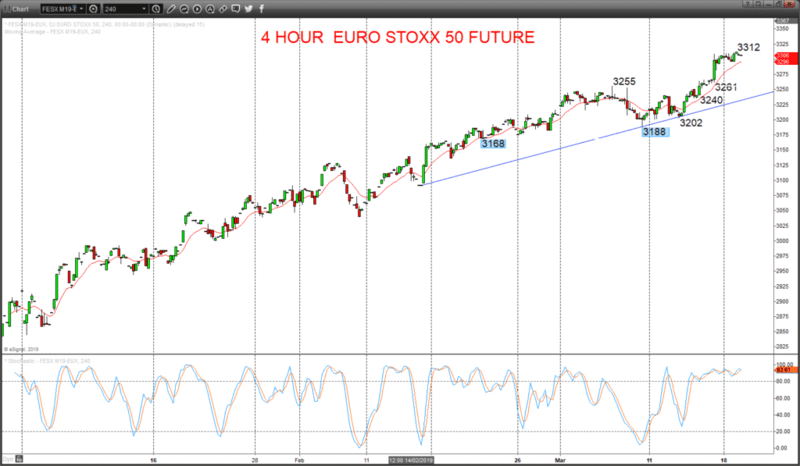 Intermediate-term Outlook – Upside Risks: We see an upside risk for 3315. Higher targets would be 3344 and 3412. What Changes This? Below 3188 shifts the outlook back to neutral; through 3168 is needed for a bear theme. A strong rally Monday through resistances at 7172/77 and 7200/01 to another new cycle high for 2019, to build on Friday’s firm advance through the prior February and 2019 cycle high (at 7133.5), to re-energise both short- and intermediate-term bull trends, leaving risks higher for Tuesday. We see an upside bias for 7221.5; break here aims for 7233.5, possibly 7250/51. But below 7179 opens risk down to 7142, that we would look to try to hold. Below targets 7123. 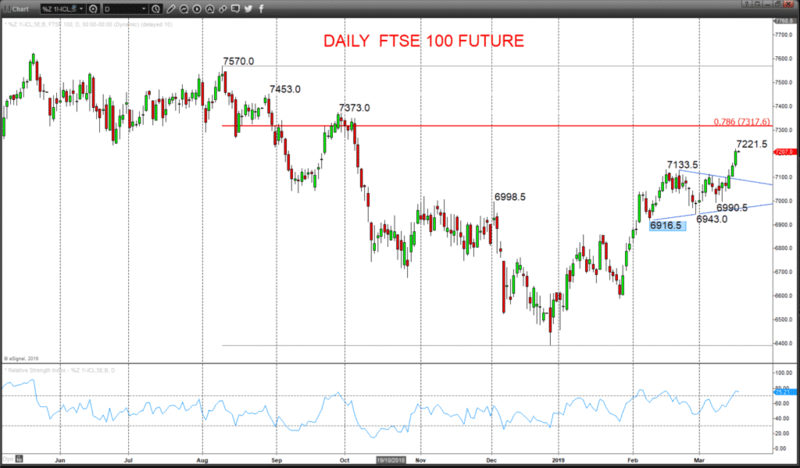 Intermediate-term Outlook – Upside Risks: We see an upside risk for 7455.5 and 7654.5. What Changes This? Below 7000.5 shifts the intermediate-term outlook straight to a bear theme.